Fans of the Bravo TV show 'Flipping Out' know that the show's star, designer/house flipper Jeff Lewis, can be an obnoxious jerk sometimes, but that he also has a soft side when it comes to his furry family members. 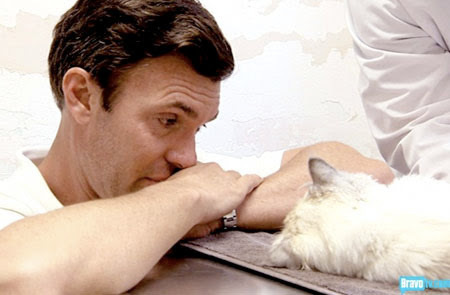 During last night's Season 6 finale, a collective sob could be heard across the nation (or Twitter, at least), as the Jeff Lewis Design team had to say goodbye to their beloved cat, Monkey. The blue-point Himalayan was Lewis's first feline, given to him by his previous partner Ryan (yeah, remember him? ), and the aging kitty's health was shown in rapid decline this season due to a myriad of escalating issues. Knowing that his time was coming near, Jeff brought his boyfriend Gage, housekeeper Zoila, and best friend/assistant Jenni along to the vet so they could all say one final goodbye. The end result was a heart-wrenching look at the process of letting go of a pet, and one of the "realest" things I've witnessed on reality TV in awhile. I know I can't be the only one whose heart broke into a million pieces watching Jeff stroke Monkey while telling him he loved him and thanking him for being his cat. Anyone who has ever lost a pet could relate to the cast's pain last night, and cried right along with them. In the exclusive Bravotv.com clip above, Jeff can be seen reflecting on his relationship with Monkey, and breaking down while talking about loving him unconditionally. If you're really in the mood to torture yourself, grab a box of tissues and click here to watch the full "Goodbye Monkey" clip as it aired, but I will warn you again that it's very, very sad. RIP Monkey! You had a great life filled with lots of love, and will be forever missed. I cried buckets when I watched it last night, and just remembering it now brings tears to my eyes. I also thought, I don't recall anything like that on any "reality" show. In contrast to all of the contrived drama and "fake reality" that is often featured on this type of TV shown, it seemed very real, and heartbreaking. You'd have to not have a soul to watch that without crying. OMG, last night's episode totally broke our hearts. It was so, so clear that Jeff loved Monkey so very much. Tracey and I were both crying buckets, and went through a lot of tissues. I could not watch the video here. Too sad to think about it (I'm in tears and I haven't even seen it!). I remember too well my 2 kitties I've had to put to sleep in past years. This is the hard part about loving a cat. Although I'm Not A Cat Person, Or Even A Dog Person, For That Matter, I Loved; "Monkey" Even Though I Had Never Met Him Personally. He Was My Favorite Cast Member On; "Flipping Out." It Was Heart Wrenching To Watch The Scenes At The Vet. I Wish They Wouldn't Have Shown Them, But I'm Sure It Was Done To Illustrate Jeff's Undying Love For His Pets, Particularly, Monkey. It Also Showed That Jeff Really Does Have A Heart, Too Bad He Treats His Pets Better Than He Does His Co-Workers ( Even His Partner; Gage ). I Agree It Is The Realist Moment In Reality TV History. This was so sad yet so beautiful! I have put so many kitties down over the years and watched many beloved community cats that I have cared for pass as well. I call them all my spirit cats now. I take comfort in knowing we will all meet again on the other side one day and what a great reunion that will be! I saw that part of the episode and it was really sad. I know how much saying goodbye to a beloved pet can be extremely hard. Monkey is in cat heaven now, may he rest in peace. I couldnt even watch such a thing as id end up in a mental hospital because of my love fior all kitties. Iam glad this was just a show and not for real thank God. Very mixed feeling about this episode. Our vet had just been over (Merlin is in end stage kidney disease) so of course I'm balling my eyes out. Happy to see something never seen before on a reality show but sad that Monkey's final moments were exploited by a camera crew. A kinder, more respectful ending would have been a private euthanasia at home and a filmed memorial AFTER Monkey was at peace. What a way the end the season. It's all about ratings. You can bet there will will a new kitty in the new season. Awwww..I saw the post about Monkey on FB....and still can't bring myself to watch Jeff's season finale! I loved watching Monkey...esp. how comfie he was assisting Jeff in his "in box"....I love what an animal lover Jeff is...he does have a heart! I watched the season finale twice and how true and heartfelt it was. Many people take their pet to the vet and leave it as they cannot bear to be there with them which I have never understood. Monkey was always there for Jeff and indeed was his best friend and Jeff was there for Monkey in turn, at the end, however painfu it was, so kudos to you Jeff and have fun at the 'Rainbow Bridge' Monkey while you wait there for Jeff.